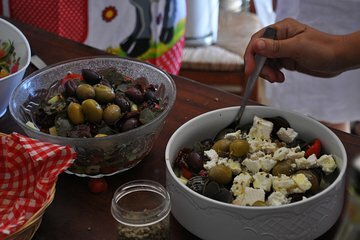 Savor the best of Santorini’s gastronomic traditions thanks to this 4-hour private food tour and cooking lesson. Sample some of the island’s top wines during visits to two of its top wineries. Then learn about some of Santorini’s most iconic agricultural products like white eggplants at a local farm. Cap it all off with a cooking lesson and lunch incorporating local foodstuffs. This was our least favorite tour. Many reviews talked about Marcos, a great guide that people really loved. Well, we were not that lucky and got Sabine, who was not overly friendly and operated as more of a driver than guide. You can easily recreate this tour with a taxi for a lot less money. The wineries we saw were interesting, but each took no more than 20 min. We then arrived at Maria's farm early and had to wait about 20 min because they were not ready for us. Maria was nice and the cooking lesson fun, but almost everything we cooked involved lots of onions, which I hate, so I could not eat 95 of what we cooked at the end of the day. My suggestion is to avoid this tour. Friendly and informative guide for the tour. The cooking class was simple but really fun. I would recommend to others, particularly if you do not rent a car while in Santorini. Absolutely one of the highlights of our trip! We loved our guide Marcos. He was extremely knowledgeable and personable and so much fun. The wineries we visited were amazing, and garden and lunch we made with Maria was just spectacular. I can't say enough about this trip. Thank-you! If there were an option for an added sign, we would use it for this tour! Let me start by saying that this felt more like meeting a distant relative for the first time than a tour. Markos welcomed us with a sweet pastry, for a sweet start to our day. Santorini was our last stop in Greece and this gourmet experience was the best one we had. Santorini Experts does not just connect you to the place, they connect you to the people! One of our stop was Gavala winery, one of the two oldest wineries on the Island, where Marietta gave us a tour of the cellars, gave us a history of the winery, introduced us to the owner and had us taste their productS! Our second stop, was another winery with a magnificent view. Finally we met Maria, a small organic farm owner, who grows her own grape for wine, preserves capers, caper leaves, tomatoes, and incredible cucumber/melon hybrids. She will welcome you with a big smile in her cellar and teach you her family recipes for the island's famous salad, tomato balls, tzatziki, as you try out her home made wine. You'll eat lunch right next to the store and, if you are lucky, will also share the best moussaka you will taste in Greece. By the end of your encounter, you'll feel and know that even if the tour is over, you made friends you could still call if you needed anything on the island. If you are going to do a tour in Santorini, Santorini Experts is the way to go. Markos is kind, caring, hardworking and will make it his personal mission to give you exactly what you want.